My approach to investing has fit the philosophy, "Give a man a fish and you feed him for a day, but teach a man how to fish and you feed him for life." Today, I'll make an exception and outline my analysis for Ternium Steel, one of the most profitable steel companies in the world. FULL DISCLOSURE: I currently own shares in Ternium. At any point, this could change. Please do your own DUE DILIGENCE before making any investment decision. Ternium Steel is a Latin-American steel producer with principle operations in Mexico, Argentina, and Venezuela. When I first began going over the financials of Ternium in late September, it didn’t take long to realize that this was one of the most profitable steel companies in the world. The numbers literally jumped out of the page. At the time, Ternium had an enterprise value (EV = mkt. cap + net debt) of $7.5 billion. In 2006, free cash flow was some $840 million. In 2005 free cash flow was over one billion dollars. EBITDA (earnings before taxes, depreciation and amortization) for 2006 was $1.84 billion, implying that Ternium was selling for only 4.1x EBITDA. Even for a steel company this was absurdly low. A quick comparison of peers yielded an average EBITDA multiple of just over 7. Operating margins, at 27%, were among the highest in the world. Ternium boasted a low-cost structure that was best in its class. Ternuim’s Mexican operations included access to iron ore, the main component in steel production, providing Ternium with a cheaper supply of this raw material. So what was the catch that made Ternium so incredibly cheap? Simply, the market couldn’t seem to get over Ternium’s exposure in Venezuela. At the time, there were threats that Hugo Chavez would nationalize SIDOR, a Venezuelan steel mill which was 60% owned by Ternium, and 40% owned evenly by the Venezuelan government and SIDOR employees. Some careful analysis suggested that the odds of nationalization were low. Ternium is run by the Rocca family, which has a stellar reputation of running steel mills spanning decades. Their impressive management of Tenaris, another Latin American based steel producer was indicative of the family’s ability and competence in operating steel companies in Latin America. Overall, Venezuela benefited enormously from having SIDOR remain under the control of current management. In any case, Venezuelan operations represented 25% of Ternium’s EBITDA. So if the worst case scenario played out and SIDOR was nationalized and Ternium received nothing from Venezuela, EBITDA would decline from $1.84 billion to $1.4 billion. At this rate, Ternium was still selling for much less than comparable international steel companies. In the end, nationalization of SIDOR would not substantially impair the overall operating profitability of Ternium. Ultimately, an agreement was reached that avoided nationalization. In exchange, Ternium agreed to sell more steel to Venezuela at a slight discount (~5%) and agreed to make some capital investments in SIDOR. In April of 2007, Ternium had reached an agreement to acquire Grupo IMSA for $1.7 billion. IMSA is a dominant steel producer in Mexico with additional operations in the southern and western United States. IMSA would add another 3 million tons to Ternium’s annual finished production, bringing total capacity output to 15 million tons. The deal was closed a few months later and in December, Ternium struck a deal with Australia’s Bluescope Steel to sell off IMSA’s U.S. assets for $730 million, allowing Ternium to focus on the steel industry in Latin America. According to the International Iron & Steel Institute, steel demand in Central and South America is expected to grow at a 4% clip for the next several years. In Mexico, the steel market is growing by over 6%. Only Asia is consuming steel at a higher rate than Latin America. The threat of cheap Chinese steel imports is minimal at best. The costs of shipping a ton of steel over to Central and South America would make the steel more expensive. And being that Ternium runs a very tight ship (no pun intended), I don’t see Chinese steel imports representing any meaningful threat. For the first nine months of 2007, Ternium generated nearly $700 million in free cash flow. This figure included a $300 million one-time income tax payment made as a result of the IMSA acquisition which Ternium will be able to use as tax credits in the future. As a result of the IMSA acquisition, Ternium assumed some $3.6 billion in debt, implying a $10 billion enterprise value. I expect the proceeds of sale of IMSA’s U.S. assets will be used to pay off some of this debt. Actual free cash flow, adjusting for the one-time tax charge was over $1 billion for the first nine months of 2007. EBITDA over the same time period was $1.7 billion. Normalizing these figures over 2007 would imply a FCF/EV yield of 13% and EV/EBITDA multiple of approximately 4.5x. To be conservative, assume that 2007 free cash flow comes to $1 billion, implying no free cash flow in the last quarter. If over the next five years, FCF were to grow by an unrealistically low 10%, the present value of this sum of money discounted back at 10% would be $5 billion. Applying a very reasonable terminal value of 10 times 2012 FCF ($1.6 billion) equates to $16 billion, or a present value of roughly $10 billion, for a total value intrinsic value of some $15 billion. With 200 million shares outstanding, this provides an intrinsic value of $75 a share. If cash flow grows at 15%, intrinsic value per share comes to around $92 per share. A 10% increase in shares outstanding would produce an intrinsic value of $68 to $83 a share. Ternium is currently earning about $220 in EBITDA per ton of steel and is on track to sell some 10 million tons in 2007 (without IMSA) compared to 6,600 tons in 2005, a growth rate of nearly 24% a year. This equates into 2007 EBITDA of $2.2 billion. As I mentioned, IMSA adds 3 million tons of capacity, but with the sale of the U.S assets, capacity will be slightly reduced. In addition Ternium is undergoing its own capital expansion that should increase capacity by 2 million tons in three years. In five years, tons sold should easily approach 14 -15 million, or less than 10% growth a year. At an average EBITDA of $160 per ton, some 30% less than Ternium’s current level, this would produce an EBITDA of $2.24 to $2.4 billion. At 8x - 10x EBITDA, a very reasonable buyout multiple for any strategic buyer, Ternium would be worth between $17 and $24 billion, or $85 to $120 a share. For years, Berkshire Hathaway's gigantic cash pile has been growing at a faster rate than attractive opporutnities available to Warren Buffett to invest in. 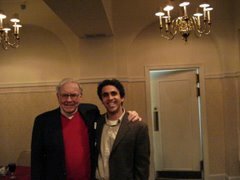 Buffett has made it no secret that he would welcome a huge "elephant" type acquisition for Berkshire where he could deploy ten billion dollars or more of Berkshire's cash. Recently, Buffett has found pockets of opportunity to plunk down a few billion here and there – the Marmon deal for $4.5 billion and a few billion for nearly 20% of railroad operator Burlington Northern. Yet as Berkshire's size has mushroomed, the days when Buffett could chunk nearly 20% of Berkshire's book value into Coke are rare. It turns that an elephant of an opportunity may lie in the same field that catapulted Buffett and Berkshire from the multi-million club to the multi-billion club – insurance. Late last year, Buffett announced that Berkshire Hathaway had agreed to deal terms with the state of New York to set up shop as a municipal bond insurer. Initially this was a small deal for Berkshire, but the hope was to gradually expand the newly set up Berkshire Hathaway Assurance Corp (BHAC) bond insurance operations across other states. It didn't take long for Buffett to up the stakes, as he is apt to do when great opportunities exist. Earlier this week, Buffett announced that he had offered to assume liability of the municipal bond insurance operations of MBIA, Ambac and FGIC Corp. In a letter to MBIA, Ajit Jain, President of BH Reinsurance, stated that BHAC's capitalization would be increased to five billion dollars and that "we would undertake not to reduce BHAC's assets by dividends, fees, etc., for a minimum period of ten years." Jain ended the letter by saying "We would be prepared to complete this transaction within the next five days." A closer look into the municipal bond industry reveals why Berkshire is so intrigued by this rare opportunity. According to a recent article published in the Wall Street Journal, the current municipal bond market is approximately $2.6 trillion. Roughly half of this amount is insured by MBIA, Ambac, FGIC, and a few other smaller names. The Wall Street Journal recently cited that in some cases, municipal issuers have paid as much as $2.3 billion a year in premiums to just insure their bonds. And Buffett's offer was on approximately $800 billion or so in municipal bonds. Even for Berkshire, this is serious money. Municipal bonds are issued to finance government infrastructure and are often collateralized by the tax revenues of the issuing entity. Since taxes are going away anytime soon, municipal bonds don't default much. According to the article, the state of California, one of largest issuers of municipal bonds, the state requires that tax dollars go first to education and second to pay off bond debt. To wrap your head around why default is unlikely, California's estimated $100 billion in annual tax revenues should do a good job of keeping them from default. Since 1970, municipal bonds rated double B have a cumulative average default rate of 1.74%. The equivalent default rate for double B corporate bonds is – 29.93%. Before this current credit crisis, a state like California with its stable tax revenues would benefit very little from having bond insurance. Deciding whether or not to insure bonds is a simple exercise in cost benefit analysis. For example, if a state issuing municipal bonds is looking at paying 4% with insurance versus say 4.75% without insurance and the insurance premium is 50 basis points, then it makes sense to insure. The recent bond-insurer crisis has created a situation whereby even rock-solid municipal bonds are finding it increasingly expensive to fund much needed infrastructure projects. And not all states are sitting flush like California. Typically bond insurers were charging about 30% of the interest savings an issuer would get. So, if you could reduce your bond rate by 0.50% via insurance, the typical premium would be about 30% of that, or 0.15%. Those days are gone. Recently insurers are charging 80% to 90% of the savings. And with investors traumatized by the liquidity crunch, municipal issuers have to rely on bond insurance even with the higher rates. Enter Berkshire Hathaway to seize the day. Here, the case is glaringly obvious. Berkshire arguably boasts one of strongest balance sheets of any company in the world. Its triple-A credit rating is virtually assured. Any municipal issuer that decides to insure with BHAC will guarantee itself a triple-A. In today's rocky credit environment, that implicit guarantee is worth a lot – and Buffett knows it. As a result, BHAC will be able to command higher premiums. And if, as I suspect will be the case, Berkshire will be the insurer of choice in each state that it decides to enter. And since just about all other bond insurers are desperately seeking to raise additional capital, Berkshire will have virtually no initial competition. So when you add A, B, C, and D, you find an investment opportunity that is vintage Buffett. This deal offers an excellent model for all investors, both individual and professional, to emulate. Look for companies that offer durable competitive advantages, long-term growth opportunities with minimal downside, and selling at very favorable prices. And then when you find them, don't hesitate to back up the truck and load up.